Finnish American neo-futurist architect and industrial designer, he realised some of the most iconic mid 20th Century architecture, including the Gateway Arch in St. Louis, Washington D.C.’s Dulles International Airport Terminal and the Kresge Auditorium on MIT’s campus. His furniture design was equally ground breaking. 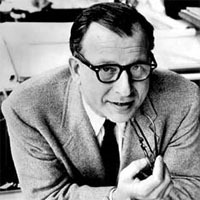 Bought up by his parents in Michigan, Eero’s father, Eliel Saarinen was already an acknowledged architect and teacher at the Cranbrook Academy of Art, where Eero attended along with other luminaries such as Charles and Ray Eames and Florence Knoll. After studying architecture in Paris, Eero also studied at Yale and spent time in his native Finland. While at Cranbrook he collaborated with Charles Eames in designing moulded plywood chairs that ultimately Ray and Charles produced as the LCW and DCW series. During the war he worked for OSS (Office for Strategic Services) intelligence agency, which was a precursor of the CIA. Having established his own architectural practice in the 1950s, he also designed several iconic furniture pieces for the Knoll Company, including the Tulip and Womb chairs, and the Pedestal Group.